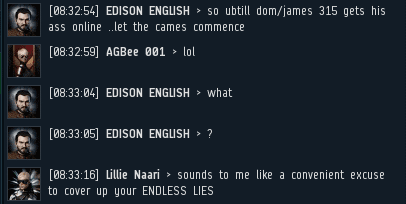 Previously, on MinerBumping... EDISON ENGLISH woke up to find his mining ship being bumped out of the ice anomaly by Agents of the New Order. He commanded them to halt, claiming that he was a friend of the Saviour of Highsec. EDISON spun a woeful tale of a dying CODE. alliance. Agent Lillie Naari didn't believe EDISON's story, but she wanted to conduct a thorough investigation of the matter. A protip for all you carebears out there: Our Agents always know more than you. Always. So far, EDISON was sticking to his story. But he had yet to produce any evidence. EDISON stalled for time. Our Agents kept on him. The miner was starting to grow nervous. EDISON's story imploded. The frazzled carebear was at a loss to prove his connection to the Supreme Protector. Our Agents were frank with the miner. Simply put, they didn't believe a word he was saying. Agent AGBee 001 dropped a hint that she knew more about EDISON's own story than EDISON did--but the miner failed to pick up on it. Agent Lillie relentlessly interrogated the miner. EDISON still wouldn't admit defeat. The pressure was clearly getting to him, though. Stray hashtags came flying out of EDISON's keyboard. He was on the verge of panic. Lillie Naari > can you prove either of these claims? Lillie Naari > Can you offer any shred of evidence to corroborate your wild allegations? The miner tried another stalling tactic. Lillie didn't mind. When the miner returned from his bathroom break, she'd be ready to continue the interrogation. Agent AGBee 001 cut to the chase: EDISON's mining permit was revoked. The miner was aghast--ten million isk right out the window. 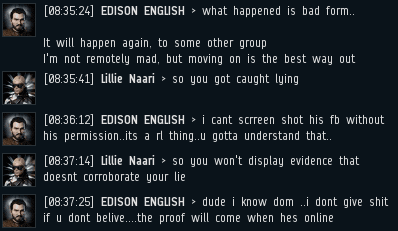 Lillie Naari > So EDISON, at this point, i guess the easier thing is to ask what you HAVENT been lying about. AGBee 001 > You strike me as a pathalogical liar, which is exactly what James says we should expect from a non-compliant miner. The sputtering miner put his head in his hands. Why wouldn't anyone believe him? AGBee 001 > EDISON ENGLISH because of your constant lies, I have no choice but to put a Triple Red Pen violation on file for you. Things went from bad to worse. These Agents meant business. 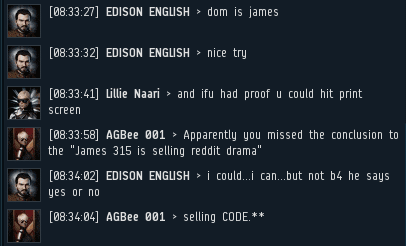 Now EDISON's only hope was for the Saviour of Highsec to miraculously appear. Jeezus christ, this edison character is quite the specimen. I'm sure Dom/James will appear in part 3 (maybe even in the flesh, or just on fb) and clears the miner. He'll turn out to be an old highschool buddy. 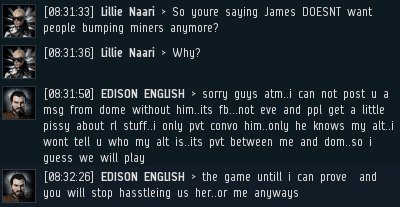 Fight the evil gankers do a great service for the peaceful citizens of High Sec. Join the High Sec Militia today! So how does one sign up for the "high sec militia"? I don't see a corp or alliance to join. Something's sketchy here. No corp, no alliance, no tacos. iam pure PVP does anyone wants to duell with me? please join so we can duell!!!!!! 339 speak for yourself, ag scum. Only ag likes shooting things that cant fight back. Gankers love shooting combat targets, ag loves shooting targets that are guaranteed to die and not be able to fight back. Gankers have alts that regularly pvp in low/null, ag hides in highsec and waits CONCORD or facpo to fight for them. Dissention among the ranks is not acceptable by code, terminate yourselves. I know James IRL, he is actually Steve Buscemi. Most of you AG won't believe me, but it's the truth, the guy is a legend. That "rat faced guy" is more successful and gets laid more than you. That makes you the ultimate fail, for posting without thinking. Awwww we gots us a carebear here aint he so cute see how riled up he is whos a lil carebear yes yous a lil carebear aint dat right. Let me guess Anon530 you measure success with money and sexual exploits. You really need to grow out of that miner mindset, your an agent of code stop acting like a greedy miner and grow up. This guy is nothing but ag this and ag that. Obsessed much, geez go pop some miners and get off the ag wagon. Tell me where ag touched you and we can file a report. James is really Donald Trump, good business sense and he's grabbing all the P***IES.